Driven by passion and ruled by integrity, Manuel Ortiz’s work with Brownstein Hyatt Farber Schreck, LLP, speaks for itself. The Democratic strategist and lobbyist has built a reputation for delivering strong results for blue-chip clients such as Sony, Microsoft, Hilton, Visa, and Verizon. 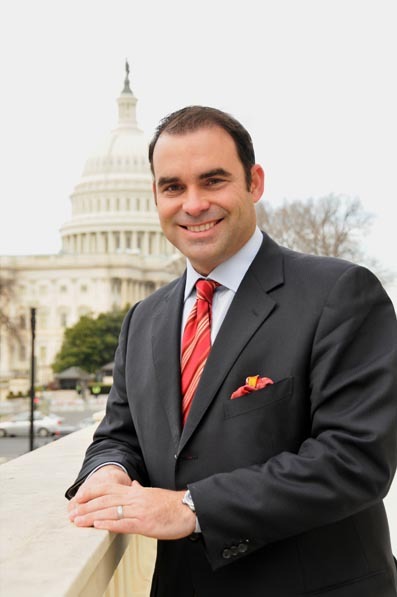 He has received accolades galore, including “the young lobbyist with the most influence in Washington” by the Washingtonian, “one of Washington’s powerhouse lobbyists” by CNN, and “one of K Street’s most influential strategists” by the Washington Post. Somehow, he’s also found time to seek a cure for juvenile diabetes and get ranked 58 on Golf Digest’s list of Washington, DC’s top 150 golfers. Here, Ortiz shares with HE how his upbringing in Puerto Rico and work as an accomplished tennis player helped get him where he is today. My first love was tennis. I became an accomplished player, touring the world. Ultimately, I earned a scholarship to play division one tennis at the University of Kansas. I played in the ATP World Tour, and tried to make it as a professional, but didn’t. But, tennis taught me the value of preparation, hard work, perseverance, and toughness. Those skills translated into my political career. There’s no secret; it’s preparation, hard work, and learning from failure. Providing solutions that render the status quo obsolete. The single most important trait in politics and the key to limitless opportunities. Do what is right; let the consequence follow. The growing force in American politics. Politics has always been in my blood. I grew up in San Juan, and one of my grandfathers was a representative in the Puerto Rico legislature and helped draft the state constitution. When I didn’t make it in tennis, my father encouraged me to go to law school. I worked as a transactional lawyer at two prominent law firms, Verner Liipfert Bernhard McPherson & Hand and Greenberg Traurig LLP, but didn’t like the grind. A few years into my career, former governor Pedro Rosselló asked me to be part of his team, and I caught the political bug. I worked hard to build a brand for myself. Over time, I became a key fundraiser. Before long, I was advisor to key senators and part of John Kerry’s 2004 presidential race. I then had a fantastic opportunity to work at Quinn Gillespie & Associates, one of the top public affairs firms in Washington, DC. It merged all my interests, and allowed me to do good. Today at Brownstein I’m a go-to guy. I serve as an advisor, strategist, problem solver, political operative, and lawyer. For example, Comcast wanted to merge with NBC and was concerned about regulatory issues, so we devised a strategy for approval. And, a financial company asked us to implement a strategy that prohibited the Securities and Exchange Commission and Department of the Treasury from imposing new rules that would change the way money market funds were regulated. The polarized political climate in Washington is challenging. It’s become very hard to pass basic legislation, such as funding the government, let alone bring solutions to ambitious issues such as immigration or tax reform. But, that’s why clients need us. Passion is in my DNA. I’m passionate about my native Puerto Rico, my work, and sports, but most of all, I’m passionate about my family. One of my four children has juvenile diabetes and celiac disease, and I spend a lot of time working with juvenile diabetes causes to raise awareness, lobby Congress pro bono to increase funding, and find a cure. I’ve also coached my children’s basketball and football teams, but our record is mixed, so the jury’s still out on how good a coach I am. I haven’t done this alone. I can’t overstate how much I learned from Ed Gillespie and Jack Quinn at Quinn Gillespie & Associates, and here at Brownstein, every day I get the opportunity to work people who have tremendous skills. I’m especially blessed to work with someone like Norm Brownstein, a founding member and chairman of the board, who’s one of the best lobbyists this town has ever seen, and he’s an even better human being than he is a lobbyist. If I had to choose another career, I’d be a CIA agent. I love what I do. That said, I always thought someday I’d go to business school and learn finance from a business perspective; I look at it from a lawyer’s perspective now. I also wonder what it would be like to own my own business. But what I romanticize the most is joining the CIA. I’m attracted to the call to duty and the daily pressure to find bad guys. I think that would be very rewarding.